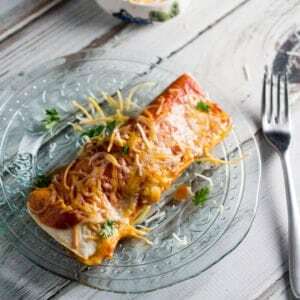 This recipe is 9 Freestyle points per serving, 2 enchiladas. Heat the Instant Pot to SAUTE and add the oil. When the oil is hot, add the onion and garlic. Stir and cook until fragrant. Add the chicken breasts and sprinkle the taco seasoning on top of the chicken. Add the tomatoes and green chilies and then lock the lid. Cook on MANUAL for 8-10 minutes, or until the chicken is cooked through. Remove the chicken and shred. Add it back to the pot and stir to combine. Spray a 9x13 Pyrex pan with olive oil spray. Fill one taco shell with the chicken mixture. Roll and place on the Pyrex pan. Repeat this process until all the chicken mixture is rolled into the tortilla shells. Add the enchilada sauce, covering each of the tortilla shell rolls. Then top with the shredded cheese. Cook for 15 minutes and serve immediately.